Whopper Ploppers, MHX Rods, and custom rod building, oh my… Revisit this episode of Mud Hole’s Facebook Live for a whoppin’ topic that you won’t want to miss! This Mud Hole Facebook Live tackles everything from lures and rods, to what’s next for your rod build once you’ve picked a lure. Optimizing a custom fishing rod based on your target lure is the best way to get the ultimate fishing performance and experience. Check out more of Mud Hole Live! Since the dawn of rod building, a common question has lingered among anglers and finally, Mud Hole After Hours has reached a conclusion. In rod building, what comes first, the lure or the rod? Although debated for decades, Mud Hole After Hours tackles this question to reveal why lures should always come first in custom rod building. When it comes to fishing the whopper plopper, it’s crucial to build the rod on a blank that can best handle this mighty monster catcher. Incredibly popular for catching big fish, the whopper plopper recently took the lure market by storm. Weighing in at 1 and 3/8 oz, the size 130 whopper plopper takes a balance of action, power, and length, that only custom rod building can bring. So, ask yourself, how am I going to fish my whopper plopper? 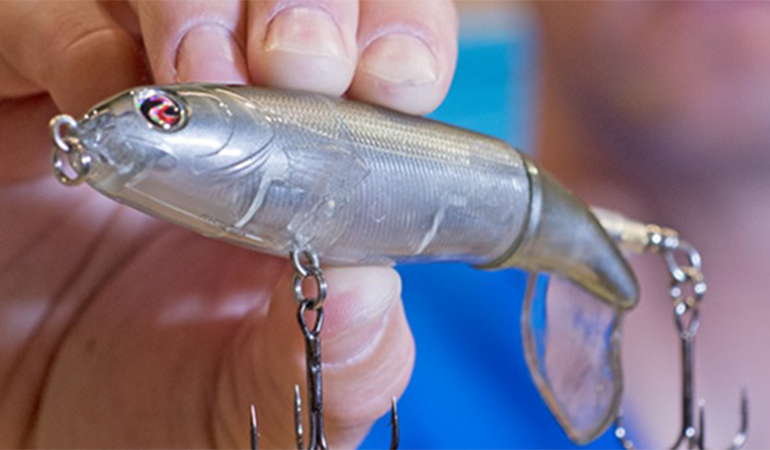 Most anglers will chuck this topwater bait as far as possible, but then their retrieve techniques may vary. For instance, some popular retrieves for the whopper plopper are to wind it in or a switch between stopping and winding it back. Although both retrieves will catch big results, thinking about the details of fishing your whopper plopper helps methodically build the highest performing rod. After thinking about how you’re going to fish the whopper plopper, you can then assess the appropriate action, power, and length for your custom rod. The technique behind the whopper plopper doesn’t exactly demand a certain action, however, this big fish bait’s treble hooks do. To avoid ripping the lure away and ruining the hookset, a fast to moderate-fast action works best to keep those big fish buttoned up. Considering the weight of the whopper plopper and the size of the fish it hooks, you need a blank powerful enough to match. Heavy to extra-heavy blanks are perfect for fishing the whopper plopper because these powers give you the boost in strength to both throw this lure and then easily wrestle the pinned down giant back to the boat. And since the goal is to cast this lure a country mile, the length of the blank should probably be over the 7-foot mark at least. Whether choosing a blank that’s 7’3”, 7’4”, or 7’6”, these are the most efficient blank lengths for casting a whopper plopper as far as possible. Now knowing what it takes to fish the whopper plopper, the best blank for the job is the FP885-MHX Rod Blank. Maximizing fishing performance, efficiency, and experience, building a custom rod to fit your favorite lure is the secret to dominating your competition. Whether fishing a whopper plopper, crankbait, trick worm, or anything in between, Mud Hole Custom Tackle has the all the blanks, components, and knowledge to help you build the best rod!